Set Sail with Us: Specialising in tours to Sandy Cay, Eastern Jost and Little JVD. The BVI’s only locally-built traditional day sail vessel! Large enough to spread out on deck for a down-wind nap and small enough to provide an exclusive feeling of your own private yacht! Profits from day sails benefit the Jost Van Dykes Preservation Society’s youth sail & dive training programme and its conservation work. * Boat minimum to sail is $500— (based on 4 person). Affordable enough for a couple or small family. Each person thereafter is $125 pp. * What’s included: Cooler with ice, water, beer, wine, soft drinks and rum cocktail of the day and snorkel equipment. Kayaks provided per advance request at no extra charge. Snorkel gear included, just be sure to let us know your shoe size. Learn about the history of the building of this special boat below. Jost Van Dyke is a small seafaring island with strong boating traditions. Sailing in modes, locally-built ‘Tortola Sloops’ was at the foundation of the social and economic life of every BVI island. Imagine the scene at the turn into the 20th century: Men load a small sailboat with bananas, yam, potato and other market goods; paying passengers line the modes deck, shoulder-to-shoulder, hoping to catch a ride to buy or sell at the market and visit friends and family; or folks seeking work on the larger neighboring islands. Rounding out the scene, livestock farmers tie halyard lines around the bellies of cows or sheep and with a great ‘Heave-ho’ the animals join the motley crew. In honor of the traditions and heroics that sailing period, the JVDPS’ major flagship programme is the construction of a 32 foot wooden sailing vessel, named Endeavour II, whose design is based on those sloops of old that emerged during the post-Emancipation era and is specific to the Virgin Islands. 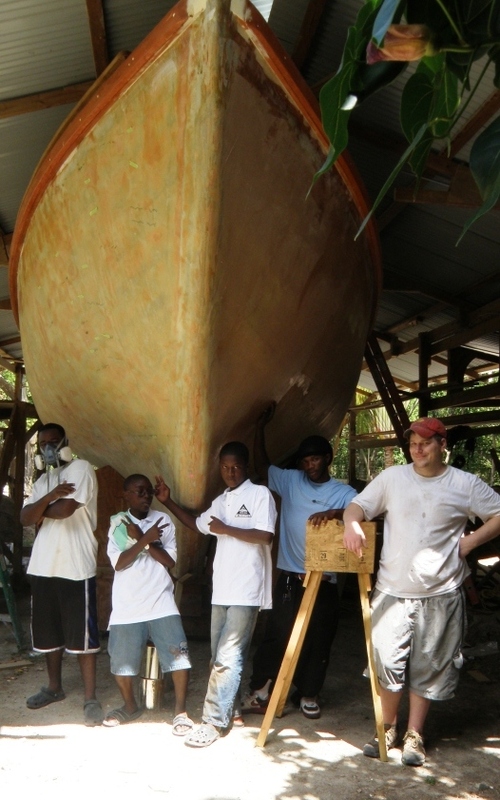 The JVDPS’ major flagship programme involves the building of a 32 foot wooden sailing vessel, whose design is based on the “Tortola Boats”, a type of sailing vessel that emerged during the post Emancipation era and is specific to the Virgin Islands. Under the guidance of caring, professional boat builders, the work of a slew of volunteers, and over 8000 youth apprentice work hours, and the careful move of the sloop to Great Harbour’s waters, Endeavour II is ready to serve the youth of the wider BVI. For the past 5 years it has been our goal to increase youth access to sail training and scuba certification, tying it to greater awareness and understanding of small island ecosystems and related marine issues. With our program ‘on the water’ on the sloop, we will be extending our programmes to youth throughout the BVI! To learn some of the details of how this project started and how it is continuing, browse to the Sloop’s Brief History. With the launch, we have reached a major milestone – but it is really only the beginning of a whole new phase for the Society. In March 2014 the sloop was certified by the BVI Ship Registry – and with a few details to go, including finding a qualified captain, we will have Endeavour II serving visitors, residents and youth. Keep in mind that Endeavour II will serve many purposes related to environmental education as well as the Maritime Heritage mission. Please head to our Donations page for information about supporting this unique project! Watch Video of Island Sloop Rollover!!! Having started construction in a jig-driven process with the sloops hull constructed ‘keel-up’ turning the hull over was a major challenge on ‘equipment-challenged’ JVD. Undaunted, our Project Director, Kevin Gray, designed a rolling frame that did the trick!